06:30 Pick-up from various hotels in Bangkok. 14:00 Visit to Hell-Fine-Pass Memorial museum and walk to see the mountain cutting for build the rain way by prisoner of world war II. 07:30 Relax your free time. 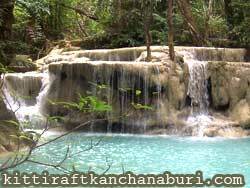 09:30 Arrive to Erawan national park and visit to Erawan waterfall, it seven steps waterfall is a most beautiful in the western area of Thailand & enjoy your time trekking, swimming, relax at waterfall. 13:00 Return to KITTI rafts restaurant have lunch at KITTI rafts restaurant. 14:30 Trekking into cave to see stalagmite, stalactite and limestone. 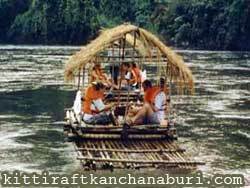 17.00 Return to KITTI rafts restaurant relax have dinner. 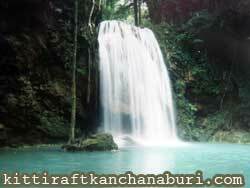 18:30 Enjoy your free time and then fallowed relax with cool breezy and stay overnight. 09:00 Relax your free time & Check out. 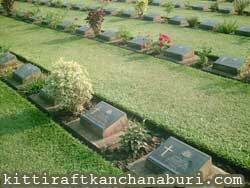 Accommodation 2 night A/C room on KITTI rafts house. Excluded: Ticket world war II museum; soft drinks. 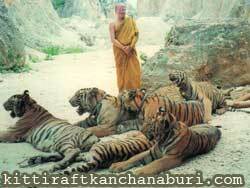 14:30 Arrive to Tiger temple wild animal rescue foundation to look at surrounding around the temple. 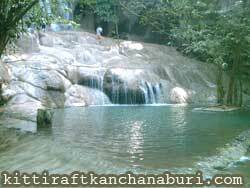 17.00 Return to KITTI rafts restaurant relax have dinner will be served in local Thai style. 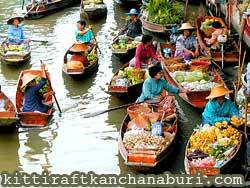 10:00 Trips to rafting on bamboo raft downstream a leisurely picturesque along the Kwai Noi river. 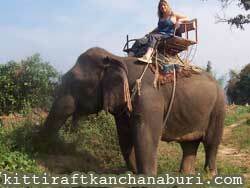 11:30 Arrive to elephant camp for trip to elephant ride in the jungle. 06.30 Pick-up from various hotels in Bangkok. 08.45 En-route visit the coconut making. 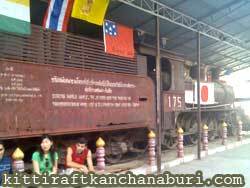 11.00 Departure from floating market to KANCHANABURI. 12.40 Have lunch at local restaurant. 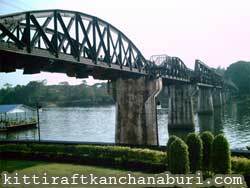 13.10 Visit World War II museum & Bridge over the river KWAI to look at surrounding. with cool breezy and stay overnight. 14:00 Visit to Hell-Fine-Pass Memorial museum and walk to see the mountain cutting for build the rain way by prisoner of world war II. 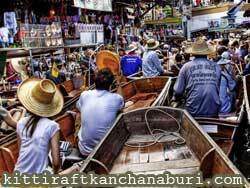 17.00 Return to KITTI rafts restaurant relax have dinner will be served in local Thai style. Remark: Time & Program are subjected to change without notice due to unexpected circumstance.